Readers of Why We Sleep: Unlocking the Power of Sleep and Dreams seeking engagement for all reading groups can gain further insight with this essential resource as a guide to aid your discussions. 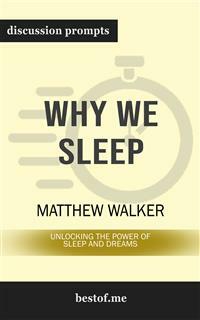 New York Times bestselling book Why We Sleep: Unlocking the Power of Sleep and Dreams is the first sleep book by Professor Matthew Walker, a leading scientific expert on sleep. He reveals his groundbreaking research on sleep and explains how we can harness its power to make our lives better. Sleep is one of the life's most important aspect that promotes our wellness, life, and longevity. An explosion of scientific discoveries on sleep is shedding a new light on this fundamental yet least understood aspect of our lives. New York Times Book Review says that Why We Sleep: Unlocking the Power of Sleep and Dreams is “a thoughtful tour through the still dimly understood state of being asleep.” They say that this is “a book on a mission.” The modern humans are “in the midst of a ‘silent sleep loss epidemic’ that poses ‘the greatest public health challenge we face in the 21st century.’” Through this book Why We Sleep, Walker “mounts a persuasive, exuberant case for addressing our societal sleep deficit and for the virtues of sleep itself. It is recommended for night-table reading in the most pragmatic sense.” In this comprehensive look into Why We Sleep: Unlocking the Power of Sleep and Dreams , you'll be equipped to prepare with the following: Discussion aid which includes a wealth of prompts and information Overall plot synopsis and author biography Thought-provoking discussion questions for a deeper examination Creative exercises to foster alternate “if this was you” discussions And much more! Note to readers: This is a companion guide based on Why We Sleep: Unlocking the Power of Sleep and Dreams This is meant to enhance and aid your reading experience, not to replace it. We strongly encourage you to purchase the original book before purchasing this unofficial companion guide. Have you ever wanted to improve your understanding of Why We Sleep? Or perhaps you are simply struggling to learn the subject matter? It’s a simple teaching technique that helps students learn and readers to grow. With versatile discussion questions for each major criteria regarding Why We Sleep, these discussion prompts are designed to help surface crucial discussions that are capable to assist toward thinking and learning on a deeper level. hy We Sleep: Unlocking the Power of Sleep and Dreams is the first sleep book written by Professor Matthew Walker. As the Director of the University of California Berkeley's Sleep and Neuroimaging Lab, Walker is the leading scientific expert on the subject of sleep. In this book, he reveals his groundbreaking research on sleep and explains how we can effectively harness the transformative power of sleep to make our lives better.